Two-way Radios | Shop Icom Digital Fixed Mount | Wi-Com Solutions Inc.
P25 is a standard for the manufacturing of interoperable digital two-way wireless communications products. Sometimes also known as Project 25 or APCO P25, this is a user-driven standard, it is not industry – or Federal government – driven standard. P25 allows for improved communications within and between agencies – especially emergency service providers. Such intra- and inter-operability is necessary for coordinating efficient and timely responses in our post-911 world. The F7000 series P25 portables support the ever-advancing P25 standard. The needs for both public service and public safety organizations are also addressed with these radios. 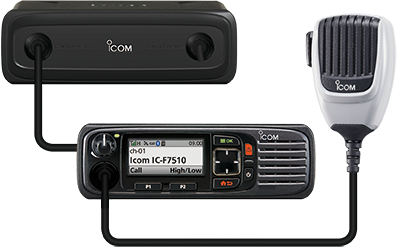 Icom’s third generation of this product not only captures the essentials, but offers dozens of new features and functions all in one new small form factor size. Public service and public safety organizations will like the built-in SD Card, GPS, USB interface, Bluetooth®, and color display. Activation options for trunking, OTAR, OTAP and more, allow for expanded or upgraded services without burdening the user with unnecessary features. Icom is the choice when you want to take your P25 communications to the next level. The high-resolution color LCD enhances the visibility both in natural and indoor lighting. Clearly labeled function and menu items make it easy to understand icons and characters. The night mode LCD setting is an alternative for use in night time or low lighting conditions. The glass is scratch resistant to protect from cracks and scratches. The F7000 series can record incoming and outgoing communications, and replay recorded communications. Add a 32GB microSD card and record up to 500 hours. The recorded audio is saved in “wav” format and allows user to replay on the radio or a PC. Users can optionally overwrite first call in first call out, if the card is full. The recording captures timestamp and individual or group ID. Unit ID is captured on individually calls and group ID is captured on group calls. Users can also scroll to playback calls on the radio. For emergency situations the F7000 series includes an emergency button and five emergency functions: man down, motion detection, stationary detection, lone worker and power OFF emergency. The motion/stationary sensor sensitivity level is programmable in 10 levels for each function. Heavy duty and portable, the F9011 and F9021 radios offer both analog conventional and P25 digital conventional operation. The P25 trunked option can be added to operate on local, regional or statewide P25 systems. Designed specifically for the public safety user, the F9011 portables provide excellent operation for both gloved and non-gloved users alike. This product series offers ergonomic advantages that make daily operation comfortable and tactical as expected. Users can choose from a basic non-display, display or display with keypad model. The large 24 character LCD displays various operating statuses and the 4-way cross keypad on the front panel provides an intuitive user interface. Icom is the smart choice for current – and future – public safety communication needs. Conforms to the standard specifications for TIA/EIA TSB-102, CAAB, Digital C4FM Transceiver Performance Recommendations and provides interoperability with other brand P25 equipment for public safety applications. The F9011 series is P25 CAP Compliant on the DHS website. Uses the DVSI’s AMBE+2™ vocoder. The F7500 series P25 mobiles support the ever-advancing P25 standard. The needs for both public service and public safety organizations are also addressed with the new P25 series. 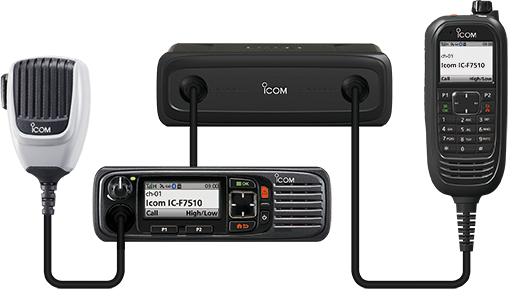 Icom’s third generation of this product not only captures the essentials, but offers dozens of new features and functions all in one new small form factor size. Public service and public safety organizations will like the built-in SD Card, GPS, USB interface, Bluetooth, and color display. Activation options for trunking, OTAR, OTAP and more, allow for expanded or upgraded services without burdening the user with unnecessary features. Icom is the choice when you want to take your P25 communications to the next level. The high-resolution color LCD enhances the visibility both in nature and indoor lighting. Clearly labeled function and menu items make it easy to understand icons and characters. The night mode LCD setting is an alternative for use in night time or low lighting conditions. The glass is scratch resistant to protect from cracks and scratches. The F7500 series mobiles allows the user to configure the radio three ways to suit almost any application or installation requirement. The intercom function is available between controllers and/or COMMANDMIC. The new COMMANDMIC is an identical physical layout and user interface as the F7010. By installing in into a vehicle it allows a secondary remote control of the F7500. The IC-F9511 series has P25 conventional and trunking capabilities as standard. You can assign individual channels to analog conventional, P25 conventional or P25 trunking, all within one radio. The IC-F9511 series conforms to the standard specifications for TIA/EIA TSB-102, CAAB, Digital C4FM Transceiver Performance Recommendations and provides interoperability with other brand P25 equipment for public safety applications. The IC-F9511 series has a 100 individual ID and 250 talkgroup ID memories. Use the display to visually select the person or group you’re going to call. The IC-F9511 series provides AES and/or DES encryption for secure conversation with the optional UT-125 AES/DES encryption unit or UT-128 DES encryption unit. The IC-F9511 series supports P25 OTAR and trunked OTAR for changing encryption keys over the air. Using the DVSI’s AMBE+2™ vocoder, the IC-F9511 series is enhanced vocoder ready. With the optional remote control kit, RMK-2 and separation cable, the front panel controller of the radio can be detached from the main unit. It allows flexible installation in limited vehicle space. Separation cable length is selectable from 1.9m (6.2ft), 3m (9.8ft), 5m(16.4ft) and 8m (26.2ft). The rugged front controller panel is resistant to shock and vibration. When used with the optional separation kit, RMK-2, the controller head has dust-protection and splash resistance, equivalent to IP54. Use the built-in CTCSS and DTCS encoder and decoder capabilities* to set up your own talk groups, and have your radio stand-by quietly when other groups are talking. You can also set up selective calls to individuals or control a repeater. Up to 512 memory channels can be divided into 128 memory zones, allowing you flexible channel and communication group management. The IC-F9511 series has a built-in 22W BTL audio amplifier. When an external loud speaker is connected to the radio, you can speak through the radio’s microphone. The RX speaker function allows you to relay the received audio over the loud speaker. The IC-F9511 series has a D-SUB 25-pin ACC connector for connecting external devices. It has reserved pins for programming to input operating channels, turn on/off functions and output received audio or honk a horn, etc. In addition, an ignition sensing line allows you to control the radio power from the engine ignition switch. Everything you'd expect in a business radio … Plus Digital! High power mobile VHF transceiver with industry-leading analog and digital P25 features.